Self-Aware Startup Teams : The creation and development of a winning team depends on the founder’s leadership. The Johari Window is a marvelous tool to help founders to develop greater self-awareness. You use it with the whole team, to save a great deal of time, and avoiding misunderstandings from wrong assumptions about others. The Johari Window helps build self-aware startup teams It focuses on soft skills such as emotional intelligence, empathy, cooperation, interpersonal and intergroup development. A characteristic of any founders is to be passionate about their endeavor. In the process, founders may miss the opportunity to tune in to the emotions of others, and harness the appropriate level of feeling. This helps to manage a successful team, especially in the early stages, when everything is urgent. 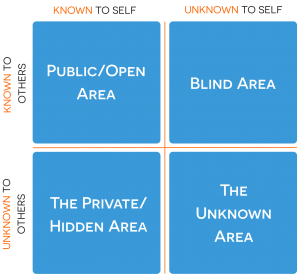 The Johari Window has four regions which represent information about a person, which is either known to the individual as well as others (public/free), unknown to the individual, but known to others (blind), known to the individual but kept secret from others (private/hidden), or unknown to all (unknown). While the overall window remains the same size, each quadrant can grow or diminish to reflect the changing knowledge shared about an individual across the four areas. (The Johari matrix to the right is thanks to the Feedback Academy). To start the process, provide a list of adjectives and ask each member of the startup team to choose words they feel relate to them. Example words might include ‘patient’, ‘supportive’, ‘trustworthy’, ‘efficient’, ‘quiet’ or ‘smart’. Then ask another team member to describe the person. They may choose similar or different words. There will be attributes that are shared (in the open space) and others that the individual is not aware of (in the blind area). There are also different attributes that the other person did not identify (i.e. that remain in the private/hidden area). Located in the unknown area are the words that neither person identified, but might be revealed given the right circumstances or opportunities. They key part of this startup teamwork building process is the mutual feedback that follows the disclosures. You may be surprised to find that other people have similar tendencies to hide the bits of themselves about which they don’t feel great or that cause them some anxiety. What is likely to be revealed is that we all have attributes that fall in the different quadrants. Surfacing them with the team can actually be fun, too. Start slowly with this part of building self-aware team startup teams, so as not to put participants off. Then repeat it, as mutual trust builds among startup team members. You will find that you gradually develop constructive communication skills that can be used both within and outside the startup team. By being open to feedback, startup team members in the group discussion can develop individually, teams can benefit, and the new venture can prosper. If this sounds a bit touchy-feely, when you just want to get on and make the new venture jump, remember that a short amount of time invested early on developing mutual trust can save time and money later. Disclose personal information about yourself in a safe environment using the Johari Window. As a result, interpersonal difficulties arising within the startup team will be dealt with much more easily. The huge benefit of building self-aware startup teams is that frustrations at the personal level do not leach out into the business, affecting customers, suppliers and other groups. More Help to Building Self-aware startup teams is on my pages about Team Behavior Building, and the Behaviors of Successful Founders.